Ryanair carried 10m passengers in October for the fifth month in succession and the eighth month in its history. 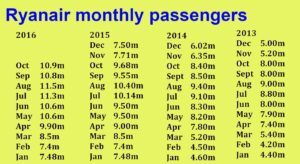 At 10.9m it was the third business month in the history of the airline and, surprisingly, 100,000 more than September. Load factor was up one point to an impressive 95pc. Annual passenger numbers for 2016 remained 16pc ahead of last year and are on course for 117m, which may be enough exceed the entire Lufthansa group of Lufthansa, Swiss, Austrian before rthey acquire Brussels Airlines, and make Ryanair Europe’s largest airline. temrporarily. Ryanair numbers are currently 4m ahead of Lufthansa. Brussels airlines caries approximately 7.5m passengers a year. Ryanair became the seventh airline to join the 10m in one month club in July 2015, a club which includes Delta, Southwest, China Southern, United, American Airlines, China Eastern and the original Aeroflot, which reached 10m passengers in one month in July 1970 and put in many more 10m months before the collapse of the Soviet Union, reaching 100m passengers a year in 1976.